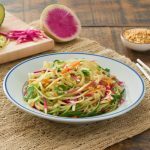 This super refreshing salad recipe is a great way to enjoy lots of hydrating produce from Ontario! 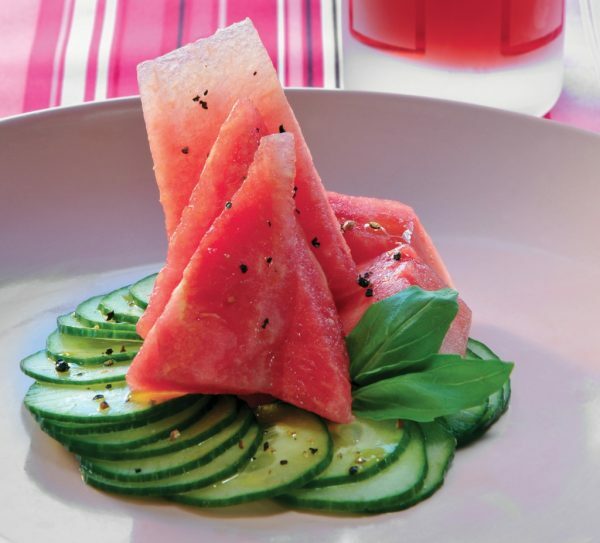 This cucumber and watermelon salad is full of fresh, thirst-quenching flavour. 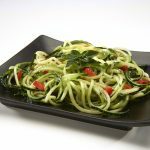 Cucumber water is a great pairing for this refreshing salad. 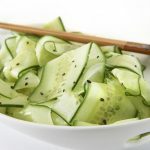 To maximize all parts of the Ontario greenhouse cucumber, add left over ends of cucumbers or slices into a pitcher of ice water. This makes for a thirst quenching beverage. Cut watermelon into cubes to make 6 cups. In a shallow bowl, gently mix watermelon pieces with cucumber, onion, vinegar, basil leaves and sugar.